Data Science Master program at Besant Technologies provided by experienced Data Scientists. Our Data Science Course module is completely designed about how to analyze Data Science with R programming and Data Science with Python programming. Data Science course certification will help you be a professional Data Scientist. If you really Interested to Learn Data Science, then Besant Technologies is the Right place. 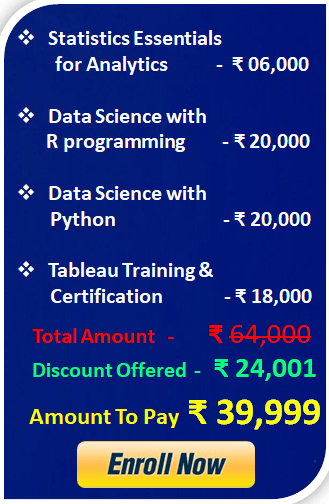 This course prepares you for the role of Data Scientist by making you an expert in Statistics, Data Science, Big Data, R Programming, Python. There is an increasing demand for skilled data scientists across all industries, making this data science certification course well-suited for participants at all levels of experience. The term “data scientist” is an industry recognized designation for a professional with deep analytics experience, industry knowledge, and skills. Our Data Science Masters Training will give hands-on experience to you to meet the demands of industry needs. All the topics in the following section will explain the basis of what it is, which scenario you want to use, What math behind it, How to implement with an analytic tool, what inferences you are getting from the final result. Data Science Careers Outlook. A shortage of data scientists means the employment outlook for professionals with the required knowledge and technical skills is extremely positive. It predicts that between now and 2020, demand for data scientists and data engineers will grow by 39 percent.